Donald S. Nisbett, 91, of Clarkston, Michigan, formerly of Topeka, passed away Sunday, January 27, 2019. He was born September 28, 1927 in Boulder, Colorado, the son of Stuart and Helen (Risley) Nisbett. He graduated from Pontiac High School in Pontiac, Michigan in 1945 and earned his bachelor’s degree in Journalism from Michigan State University in 1951. Don retired as a Major in the United States Air Force, as a pilot for 25 years. 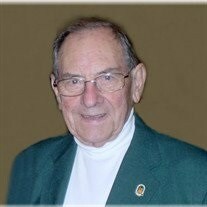 He was active in many organizations including: Honorary Cedar Lodge #60 Clarkston, Knights Templar Pontiac Commandry #2, National Sojourners, Golden Rule Lodge #90, A.F. & A.M., Topeka, where he served as Past Master and Past Secretary, Elks Lodge #810 Waterford, Arab Shrine, Friends of the Library (Clarkston), Combat Air Museum (Topeka), Community Presbyterian Church (Waterford), American Legion, V.F.W. and Topeka Scottish Rite Bodies where he had been coroneted with the 33rd degree. Don is survived by his loving wife, Nancy McDavid Nisbett of Clarkston, MI; two daughters, Denise Kemble and her husband, Stuart of Topeka and Sharon Pitts and her husband, Bill of Mustang, OK; four grandchildren; four great-grandchildren and many step-children, step-grandchildren and step-great-grandchildren. He was preceded in death by his parents, sister, Betty Bush, son, Michael Donald Nisbett and former spouse, Betty McMahan Nisbett. Visitation will begin at 1:00 p.m. Saturday, February 9, 2019 at Parker-Price Cremations, Funerals & Receptions, 245 NW Independence Ave, Topeka. Funeral services with Masonic and Rose Croix services will follow at 2:00 p.m. Burial with military honors will be at Memorial Park Cemetery, 3616 SW 6th Ave, Topeka. In lieu of flowers, memorial contributions may be made to Combat Air Museum, by visiting www.combatairmuseum.org and click donate or 7016 SE Forbes Ave, Topeka, KS 66619-1444. Add your memories to the guest book of Donald Nisbett. To Don's family: I have so many fond memories of my late husband Eldon and myself with Don & Betty when we used to square dance together with the Stratojets Square Dance Club. Also the many times we saw each other at activities of Golden Rule Lodge #90 and where Don took over as Secretary after Eldon's health required him to give it up. Our thoughts and prayers are with you and your family during this sad time. All of Don's friends will greatly miss him. Worked with him for many years at the Combat Air Museum. He will be missed by all who knew him. Fly high again and see you one day. I want to say "Thank you" for his service to our country. We send our condolences to your family in this time of loss and sorry. "Thank you" for his service to the VFW Post 1650 in Topeka Ks. Don loved the Combat Air Museum. He was never short on ideas and suggestions for improving our status as a museum. I remember his call to the museum asking if we would like to display some of Major Daniel Forbes's artifacts which he soon dropped off at the museum. This led to a wonderful relationship with the Forbes family members and now a great collection of historical items which are on display at the Combat Air Museum for all to see. Don spent a lot of his Air Force tenure at Forbes AFB in Topeka, KS where he piloted a B-47 and other aircraft during the Cold War. Don could always be seen driving a fancy golf cart as he was very involved with our annual Superbatics Air Shows at Forbes Field and the Combat Air Museum. Lastly I will always remember spending many evenings at Topeka's Croco Hall square dancing with Don and Betty. Don loved square dancing and was always dressed in full dance attire which included the Strato Jets vest with bells and whistles attached. We were all members of the well known square dance club known as the Strato Jets. Many good memories and fun times and events. We have many fond memories square dancing with Don. Also Walt is an Air Force retiree and while active he was part of the plane crew who went to Panama for 6 weeks TDY from Forbes AFB with Don as the pilot. It was a pleasure to become acquainted with Don (& Nan) as he participated with area Square Dancing and Round Dancing. I was able to participate with Cruises to Hawaii and Alaska with the 'Applecrate' Dancers' Travel Club. Strato-Jets, Wheathearts, Topeka & those Square De'lites out of Lawrence. Don was a delight! Tuesday Taco Night at the Moose in Topeka. I was pleased when he re-met up with Nan from his College Days: Michigan State. Don was so active with his history of the Air Force Service/Forbes, piloting John Hankamer and Sheriff Chaffee as well back in the day.~ He sure liked to travel about and see the countryside and World, no less. My condolences to his family. Don will be sorely missed. So sorry to hear of Don's passing. My Condolences to his family for their loss. I knew Don as a fellow Air Force retiree and as a member of the Masonic Fraternity. May God's grace shine upon him and his family. We knew Don for many years, first by sharing memories of square dancing at Croco Hall and later sharing memories at Arab Shrine Temple. Don was a special person and we always enjoyed seeing him. So sorry for your loss.